It’s Independence Day, so if you have pets and planned a trip, chances are you wrangled a pet sitter to keep your pet from starving or dehydrating to death. Next time, consider letting this infinite water dispenser help you instead. 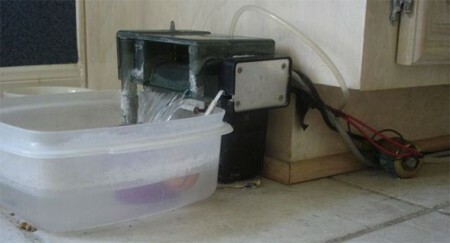 The dispenser is made of a Tupperware tub, a fish tank water filter, a float switch, and a water solenoid valve. It works essentially the same way as any toilet: the solenoid valve lets water into the filter where it is dispensed to the Tupperware container. The float switch is activated when the water in the container reaches a certain level. When the water level drops due to evaporation or thirsty pets, the float switch goes down and triggers the solenoid to let in more water. The whole works are powered by a GFI outlet for safety since this project involved water, electricity and pets.